Join us for our second 'Knit-Along.' We have been hoping Sandy Hall would teach us how to knit this vest ever since we first saw her wear it. 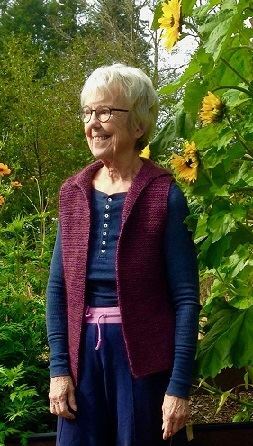 This Garter Stitch Vest is simple yet a very stylish vest. Never participated in a Knit-Along? A Knit-Along is a community activity where knitters get together and work on the same project at the same time. It allows us to work as a group, share our enthusiasm, ask questions, and solve challenges. For this 'Knit Along' you will already need to know how to knit a simple stitch and how to cast on. This Knit-Along is free for BARN members and $30 for Guests. Materials: $5 for the pattern. Knitting worsted yarn. Yardage: Small 780; Medium 910; Large 1040; XL 1170; 2X 1360. Skill Level: Advanced Beginner. Students need to know how to do the knit stitch and cast on. Instructor Bio: Sandy Hall has been knitting and spinning for over 40 years. Her felted hats are featured at the Artful Ewe in Port Gamble. As an occupational therapist and special education, she has taught variety of classes with appreciation of the select learning styles. Everyone who has taken her knitting and spinning classes at BARN rates her as an excellent teacher who's knowledge and wonderful way of working with students is marvelous.